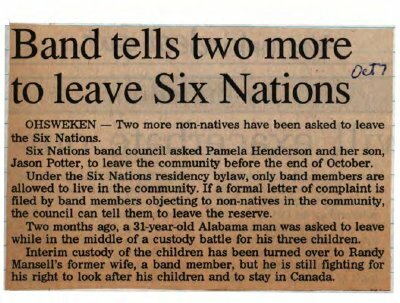 "Band tells two more to leave Six Nations"
OHSWEKEN - Two more non-natives have been asked to leave the Six Nations. Six Nations band council asked Pamela Henderson and her son, Jason Potter, to leave the community before the end of October. Under the Six Nations residency bylaw, only band members are allowed to live in the community. If a formal letter of complaint is filed by band members objecting to non-natives in the community, the council can tell them to leave the reserve. Two months ago, a 31-year-old Alabama man was asked to leave while in the middle of a custody battle for his three children. Interim custody of the children has been turned over to Randy Mansell's former wife, a band member, but he is still fighting for his right to look after his children and to stay in Canada. Henderson, Pamela ; Potter, Jason ; Mansell, Randy. Six Nations Elected Band Council.